Olé! Olé! 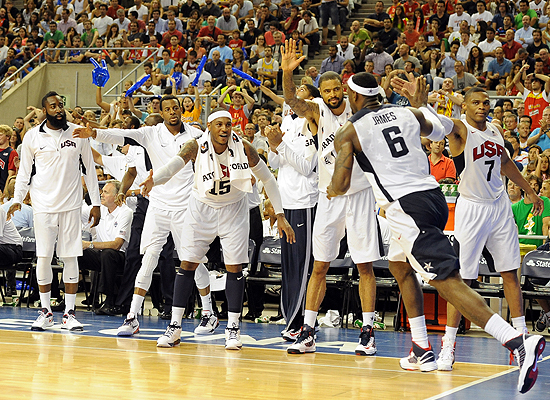 USA tunes up Spain in Barcelona ~ Roundball Manor - The House that Basketball Built. With the final score 100-78, Team USA put an exclamation point on the end of their pre-olympic tour, routing Spain in front of their home crowd with an all around dominating performance. Carmelo led the charge with 27 points, going 5-8 from deep. LeBron added another gem, scoring 25 on 3-5 from beyond, and dishing out 7 dimes. The team also received strong performances from Kevin Durant (13 points, 8 boards) and from Kevin Love in the paint with ten rebounds. Figuring the game to be much closer, the Spanish team did not live up to the trash talk they were dishing out all week. Marc Gasol did not play, so expect a different look from them come playoff time. Still, the home team were expecting a closer game, but it does not look like they will be able to match up with the athleticism of Team USA out on the perimeter. After five pre-olympic games, it looks like the trio of James, Durant, and Anthony will be doing a lot of the hefty lifting, with guys like CP3, Westbrook, Williams, and Iguodala providing defensive pressure and starting the transition game. Not sure if there is a team that can match up with the US, but Lithuania and Spain should be their best competition in the opening round. Who wants a High Five ? ?